WINNER of the 2007 Village Voice Obie Award for Playwrighting! On the 9th floor of a major downtown law firm, the temps live in fear of the unknown. Fright leads to chaos as this hysterically funny and unsettling play unfolds. 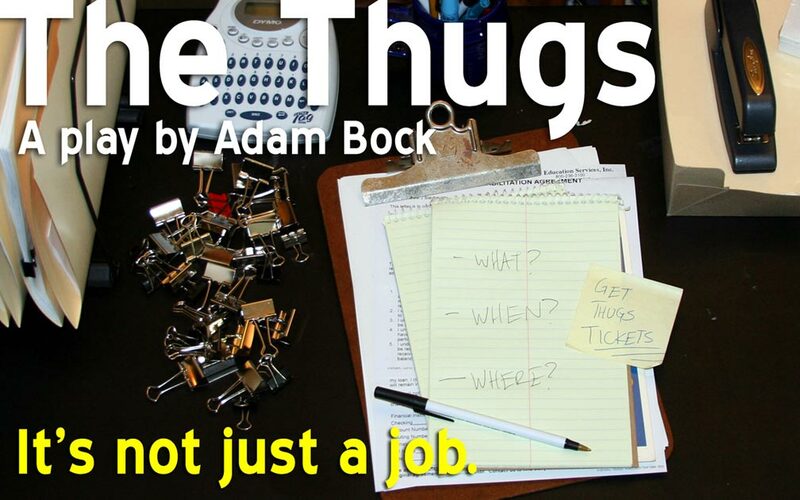 The THUGS is about work, office politics, thunder, and much, much more. CLICK HERE to read our INTERVIEW with playwright ADAM BOCK. CLICK HERE to read The THUGS‘ REHEARSAL LOG. CLICK HERE to read The Columbus Dispatch preview. CLICK HERE to read The Columbus Dispatch review. CLICK HERE to read The Columbus Alive review. Featuring Vanessa Becker, Acacia Duncan, Tamara Embrya Deshango, Drew Eberly, Eleni Papleonardos, Michelle Schroeder, Ian Short, and Jennifer Spillane. TALKBACKS after the show 9.20, 9.23, 9.27, and 9.30. 5 bucks? We’ll take it. Twenty-five bucks? We’ll take that too.